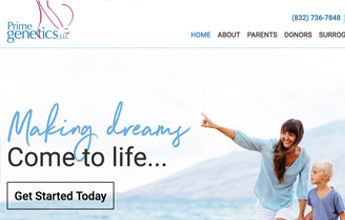 Prime Genetics, an egg donors and surrogacy agency, helps couples start or expand their families by matching intended parents with an ideal egg donor or gestational carrier. They enlisted the help of TD Media to provide a completely new donor and surrogate database. TD Media responded with a customized installation of our DonorDB system. DonorDB allows Prime Genetics complete control over the questions asked of donors, surrogates and intended parents. A custom permissions system specifies which applicant information is publicly viewable, which requires registration and which is for administrators eyes only. TD Media also provided a new mobile-friendly website design that enables donors, surrogates and intended parents to use the entire DonorDB application from both their desktop and mobile devices. TD Media provides ongoing development and hosting services for this client.